Babak Javadi of Toool.us did it again. He improved the design of the ‘last hope’ credit card size emergency pickset, and came out with a version 2.0. The previous set was just fine to me, but some people complained the metal was a little too thin (read: people were bending their picks). And the previous card was made and designed in a rush, and Babak could not incorporate all his ideas in it yet. This has all changed in version 2.0 of the credit card sized pickset. Excellent quality steel, very nice serrated tensioners(!) and broken out picks can be put on your keyring. Jos Weyers of Toool Amsterdam was kind enough to be the guinea pig and try the set for you. See him pick a toool competition lock with the new picks and rake open another one in this youtube video. This entry was posted on Saturday, April 11th, 2009 at 01:37 and is filed under Uncategorized. You can follow any responses to this entry through the RSS 2.0 feed. You can leave a response, or trackback from your own site. I’m going to say this before anyone else does this time. The original inspiration for this design was from a similar card designed by John Falle and company. Compact pick designs have always existed in one form or another for quite some time, but Falle’s was by far the best I had seen at the time. I believe we’ve taken it much further and improved on the old designs quite considerably. Don’t worry too much about what Martin Newton wrote. This ‘man of great honor’ also sometimes ehrm …. ‘borrows’ ideas and innovations from other people himself. Thanks for the great job Babak! Now all you need is a mag stripe on the pick handles to be complete the other part of ISO 7813 compliance. Not to mention that would be sweet to have it pick ATM machines too ;). Of course there’s one obvious question: How can I get one of these? I second that. 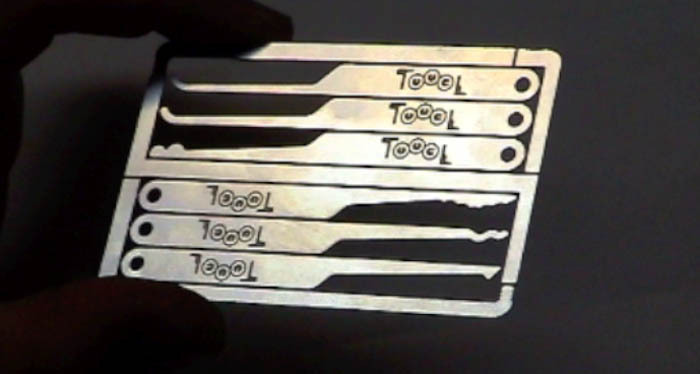 One of these would be great in my toolset… or wallet. Are these going to be mass produced? I would really like to buy one, is it possible? We already have a small batch of these made and are selling them and some conferences that we attend. You can always snag one by stopping a TOOOL board member at any conference. If anyone wants to buy a couple at a time, go ahead and send an email to admin_at_toool_dot_us and let us know how many you need. I will take 2 sets. please e-mail me if possible. Those look GREAT! I would also like to buy one of these. I was wondering, shall you be selling these masterpieces online? Perhaps in an online store of some kind? I would love to have one of these as a ‘just in case’ I forget my picks sometime! Ik woon in Nederland en zou graag een Toool creditcard nood pickset V2.0 willen kopen. Hoe kan ik dat regelen. Is er in Nederland een verkooppunt waar ik hem kan bestellen. Misschien via Jos Weyers van Toool Amsterdam. Entries (RSS) and Comments (RSS). 52 queries. 0.377 seconds.